Karen has written more than 500 feature stories for international and U.S. magazines, newspapers and online media. Read her published features stories, below. Also read her bicycle column, Spin City. Say the words "sea otter" and most people think about cute, furry marine mammals. But for those of us who immediately think "bicycle," Sea Otter means it's time to gear up for the biggest cycling festival in North America. This spring, the SRAM Sea Otter Classic will celebrate its 20th anniversary when it returns to the Laguna Seca Recreation Area in Monterey, April 15 to 18. 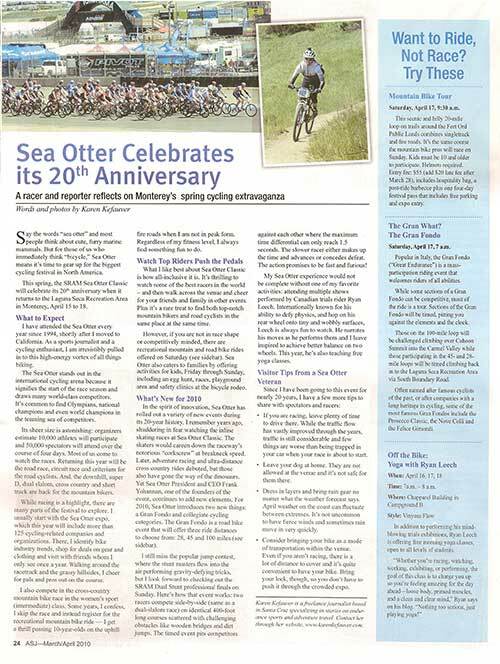 I have attended the Sea Otter every year since 1994, shortly after I moved to California. As a sports journalist and a cycling enthusiast, I am irresistibly pulled in to this high-energy vortex of all things biking. The Sea Otter stands out in the international cycling arena because it signifies the start of the race season and draws many world-class competitors. It's common to find Olympians, national champions and even world champions in the teaming sea of competitors. Its sheer size is astonishing: organizers estimate 10,000 athletes will participate and 50,000 spectators will attend over the course of four days. Most of us come to watch the races. Returning this year will be the road race, circuit race and criterium for the road cyclists. And, the downhill, super D, dual slalom, cross country and short track are back for the mountain bikers. While racing is a highlight, there are many parts of the festival to explore. I usually start with the Sea Otter expo, which this year will include more than 125 cycling-related companies and organizations. There, I identify bike industry trends, shop for deals on gear and clothing and visit with friends whom I only see once a year. Walking around the racetrack and the grassy hillsides, I cheer for pals and pros out on the course. I also compete in the cross-country mountain bike race in the women's sport (intermediate) class. Some years, I confess, I skip the race and instead register for the recreational mountain bike ride - I get a thrill passing lO-year-olds on the uphill fire roads when I am not in peak form. Regardless of my fitness level, I always find something fun to do. What I like best about Sea Otter Classic is how all-inclusive it is. It's thrilling to watch some of the best racers in the world - and then walk across the venue and cheer for your friends and family in other events. Plus it's a rare treat to find both top-notch mountain bikers and road cyclists in the same place at the same time. However, if you are not in race shape or competitively minded, there are recreational mountain and road bike rides offered on Saturday (see sidebar). Sea Otter also caters to families by offering activities for kids, Friday through Sunday, including an egg hunt, races, playground area and safety clinics at the bicycle rodeo. In the spirit of innovation, Sea Otter has rolled out a variety of new events during its 20-year history. I remember years ago, shuddering in fear watching the inline skating races at Sea Otter Classic. The skaters would careen down the raceway's notorious "corkscrew" at breakneck speed. Later, adventure racing and ultra-distance cross country rides debuted, but those also have gone the way of the dinosaurs. Yet Sea Otter President and CEO Frank Yohannan, one of the founders of the event, continues to add new elements. 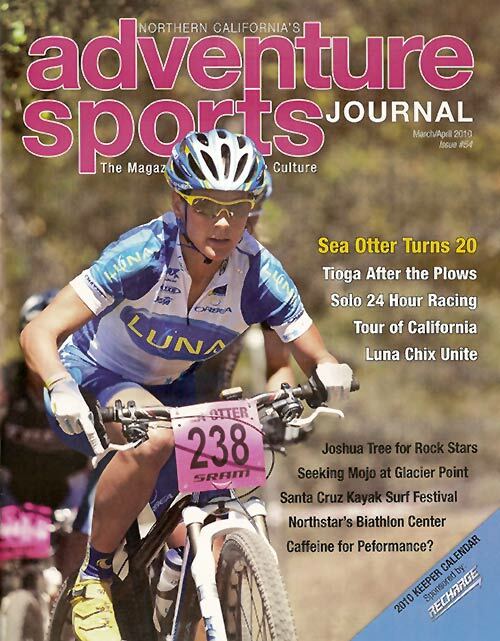 For 2010, Sea Otter introduces two new things: a Gran Fondo and collegiate cycling categories. The Gran Fondo is a road bike event that will offer three ride distances to choose from: 28, 45 and 100 miles (see sidebar). I still miss the popular jump contest, where the stunt masters flew into the air performing gravity-defying tricks, but I look forward to checking out the SRAM Dual Stunt professional finals on Sunday. Here's how that event works: two racers compete side-by-side (same as a dual-slalom race) on identical400-foot long courses scattered with challenging obstacles like wooden bridges and dirt jumps. The timed event pits competitors against each other where the maximum time differential can only reach 1.5 seconds. The slower racer either makes up the time and advances or concedes defeat. The action promises to be fast and furious! My Sea Otter experience would not be complete without one of my favorite activities: attending multiple shows performed by Canadian trials rider Ryan Leech. Internationally known for his ability to defy physics, and hop on his rear wheel onto tiny and wobbly surfaces, Leech is always fun to watch. He narrates his moves as he performs them and I leave inspired to achieve better balance on two wheels. This year, he’s also teaching free yoga classes. If you are racing, leave plenty of time to drive there. While the traffic flow has vastly improved through the years, traffic is still considerable and few things are worse than being trapped in your car when your race is about to start. Leave your dog at home. They are not allowed at the venue and it's not safe for them there. Dress in layers and bring rain gear no matter what the weather forecast says. April weather on the coast can fluctuate between extremes. It's not uncommon to have fierce winds and sometimes rain move in very quickly. Consider bringing you' bike as a mode of transportation within the venue. Even if you aren’t racing, there is a lot of distance to cover and it’s quite convenient to have your bike. Bring your lock, through, so you don’t have to push it through the crowded expo. Karen Kefauver is a freelance journalist based in Santa Cruz specializing in stories on endurance sports and adventure travel. Contact her through her website,www.karenkefauver.com. Saturday, April 17, 9:30 a.m. This scenic and hilly 20-mile loop on trails around the Fort Ord Public Lands combines singletrack and fire roads. It's the same course the mountain bike pros will race on Sunday. Kids must be 10 and older to participate. Helmets required. Entry fee: $55 (add $20 late fee after March 28), includes hospitality bag, a post-ride barbecue plus one four-day festival pass that includes free parking and expo entry. Saturday, April 17, 7 a.m.
Popular in Italy, the Gran Fondo ("Great Endurance") is a mass-­participation riding event that welcomes riders of all abilities. While some sections of a Gran Fondo can be competitive, most of the ride is a tour. Sections of the Gran Fondo will be timed, pitting you against the elements and the clock. Those on the 100-mile loop will be challenged climbing over Cahoon Summit into the Carmel Valley while those participating in the 45- and 28­mile loops will be timed climbing back in to the Laguna Seca Recreation Area via South Boundary Road. Often named after famous cyclists of the past, or after companies with a long heritage in cycling, some of the most famous Gran Fondos include the Prosecco Classic, the Nove Colli and the Felice Gimondi. April 16, 17 and 18, 7a.m. – 8a.m. In addition to performing his mind­blowing trials exhibitions, Ryan Leech is offering free morning yoga classes, open to all levels of students. "Whether you're racing, watching, working, exhibiting, or performing, the goal of this class is to charge you up so you're feeling amazing for the day ahead-loose body, primed muscles, and a clean and clear mind," Ryan says on his blog. "Nothing too serious, just playing yoga!"